We are constantly innovating to help you grow your business. 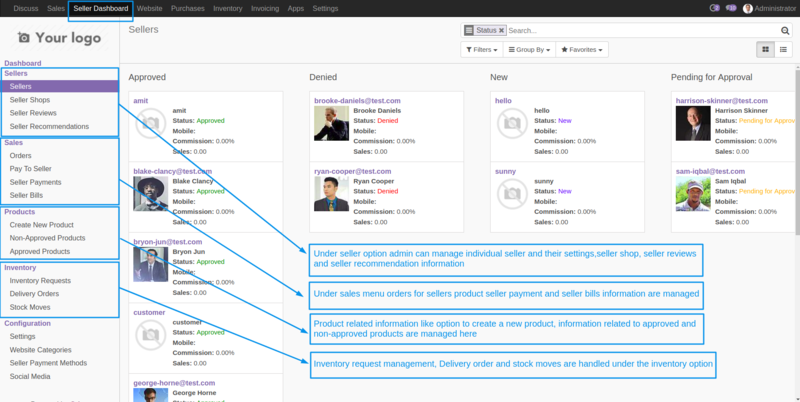 As a part of this effort, this time we are introducing Odoo 11 multivendor marketplace. Now Odoo 11 Multi-vendor Marketplace is launched with some exciting new features which will surely help to mould your business into a success story. 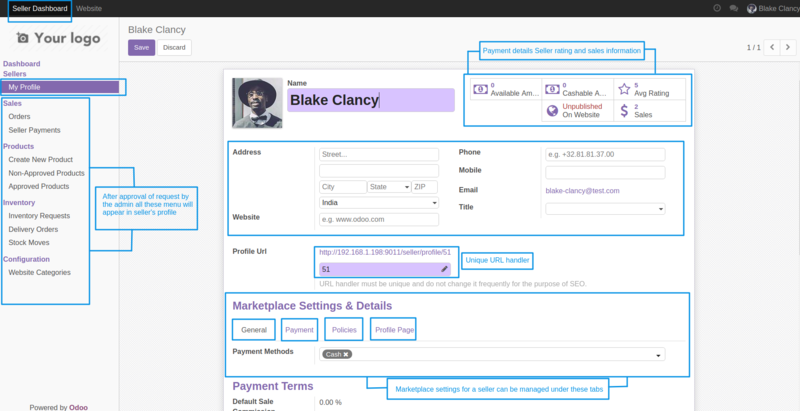 Odoo multi-vendor marketplace allows you to set up your own marketplace, where multiple vendors can sign up and register themselves to sell their products in your marketplace. This module is easy to configure, where admin can set different access rights for sellers. Sellers have their own shop page sharing their company profile and products on other shop pages, this page allows customers to differentiate products from different sellers. It facilitates to send e-mail notifications on new seller request, seller request approval, product approval, new order notification and every standard marketplace features (using add-ons for marketplace). Email notifications don’t let anything goes un-noticed. Marketplace module will prove to be a one-stop solution for your buyers who shall be making purchases from different sellers on the visit of a single online store. 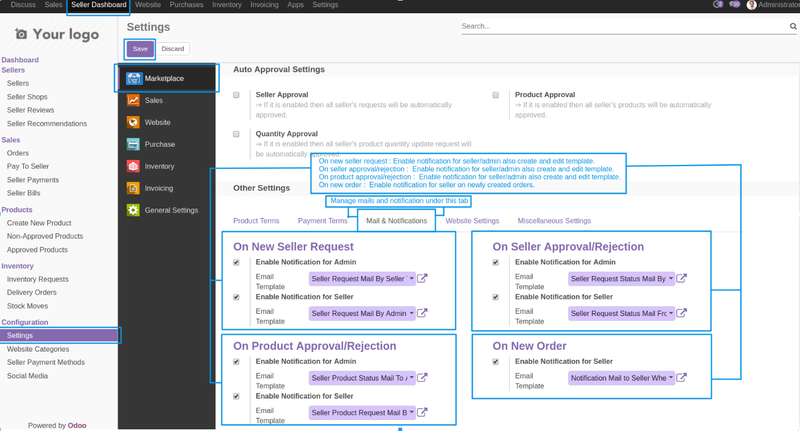 Admin can set manual or auto approval of seller request, products, and their quantity. 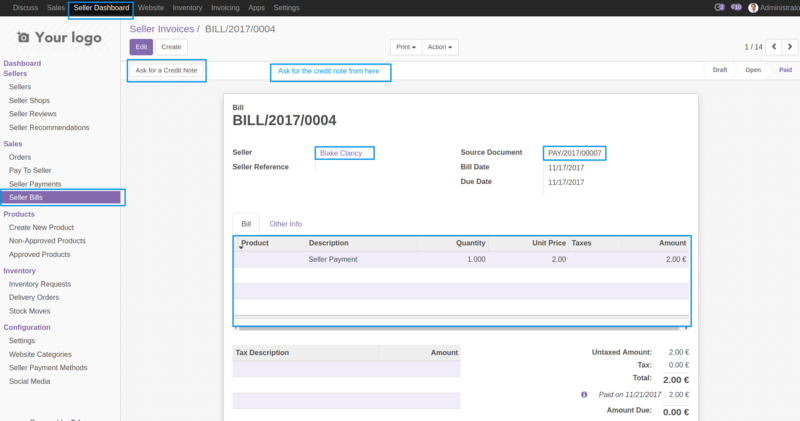 Manage bills and invoices for orders. Multi-Vendor marketplace module also helps to manage seller reviews and recommendations. 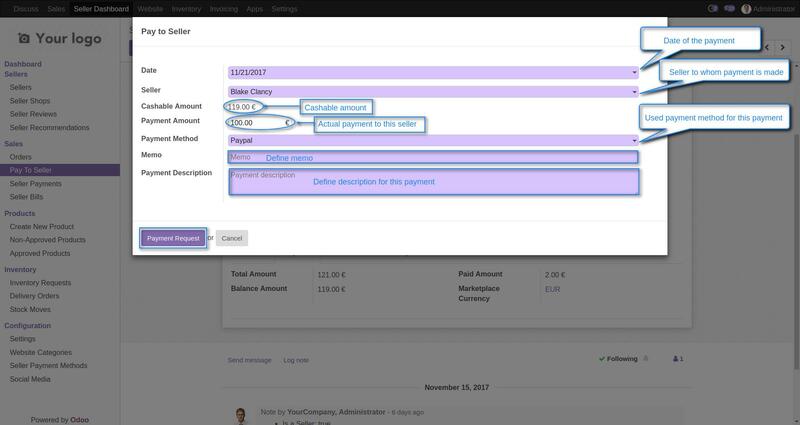 Admin can assign Manager as a user to manage responsibilities of the marketplace. Introducing officer as a user now admin can divide responsibility with officer too. Admin can manage user rights with the officer. 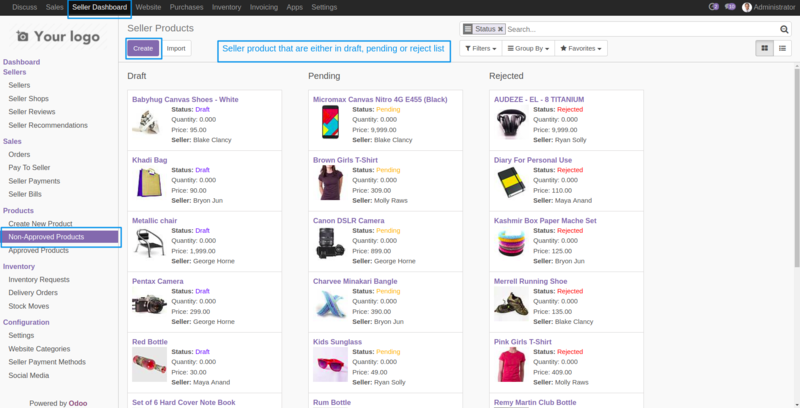 Now admin can enable/disable seller shop. 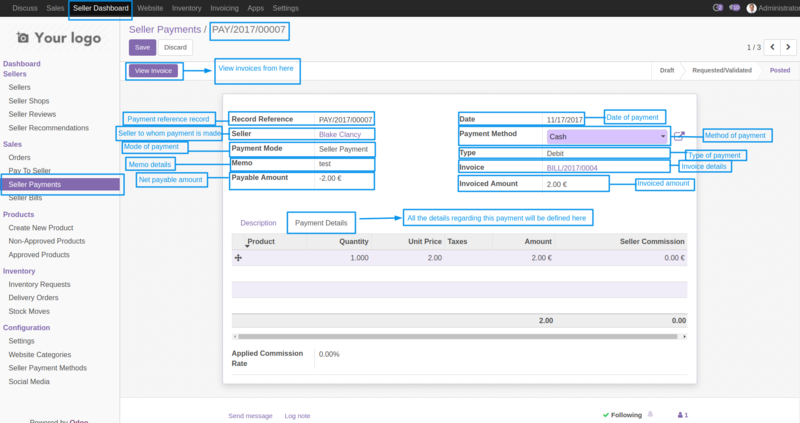 Admin will get a new flow of seller payment with “pay to seller” menu. 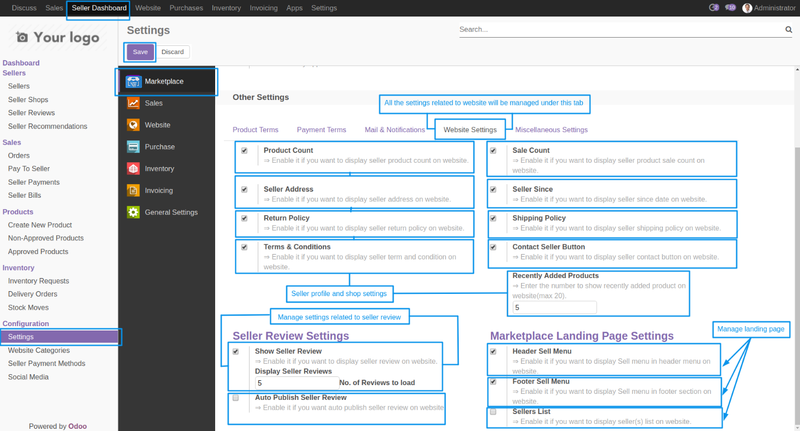 Admin can allow sellers to manage their product attributes, and define variants. Sellers can manage advanced pricing on the product using pricelist. Admin can link their profile to their social media account. 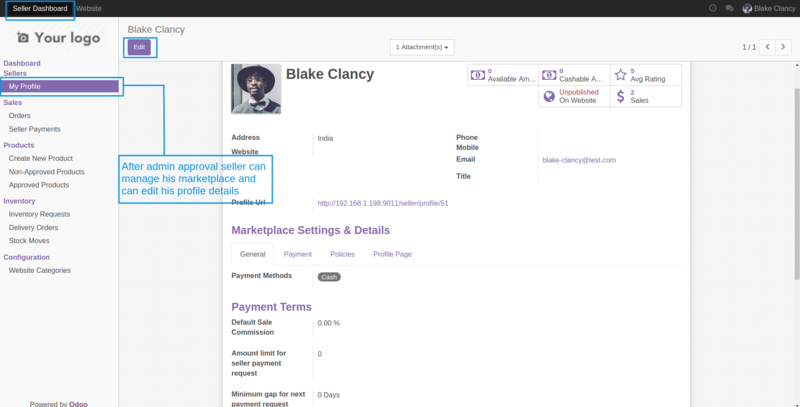 Admin can set marketplace currency for seller payment. After buying this app from our Webkul store you will get the link for downloading the zip file. Simply download it and extract then you will see the odoo_marketplace folder, now you will have to copy this app folder inside your Odoo addons path. 3. 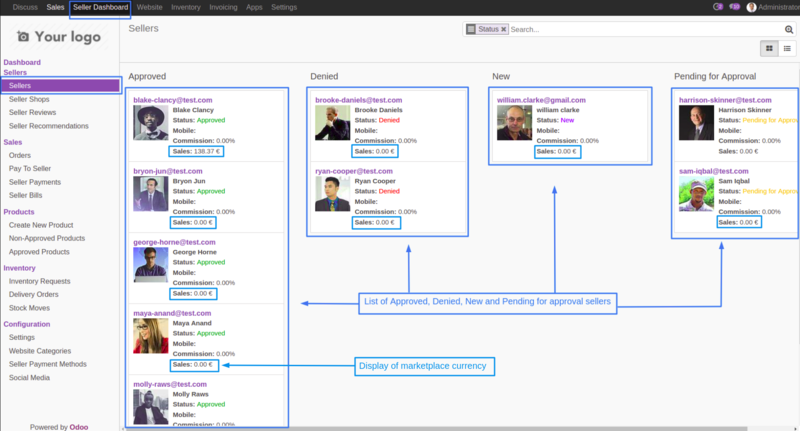 Remove the app’s filter and search for the odoo_marketplace key. Under Seller Dashboard, go to settings for the configurations of the module installed. Seller Approval: If you don’t want to approve manually each seller then enable the field “Seller Approval”. Product Approval: If you don’t want to approve seller’s every product manually then enable the field “Product Approval”. 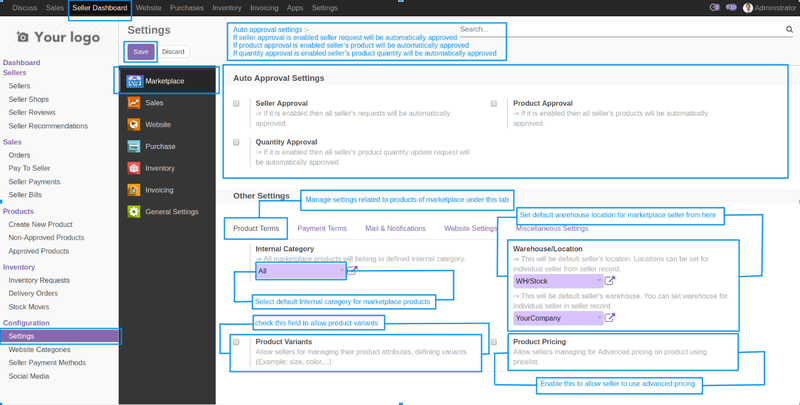 Auto Quantity: If you don’t want to approve seller’s product quantity manually then enable the field “Auto Quantity”. Internal Category: Set “internal category”, this will act as a default category for all marketplace products but it can be overridden by seller according to his requirement if the seller is assigned with the right to change product internal category. In case a product has no defined category then this internal category is counted as its category. Warehouse/location: Set “Warehouse/location”, this will act as default “warehouse” and “location” for all marketplace sellers but it can also be overridden for the individual seller. Product variants: By enabling “Product variants”, the admin will allow a seller to manage their product attributes and variants. 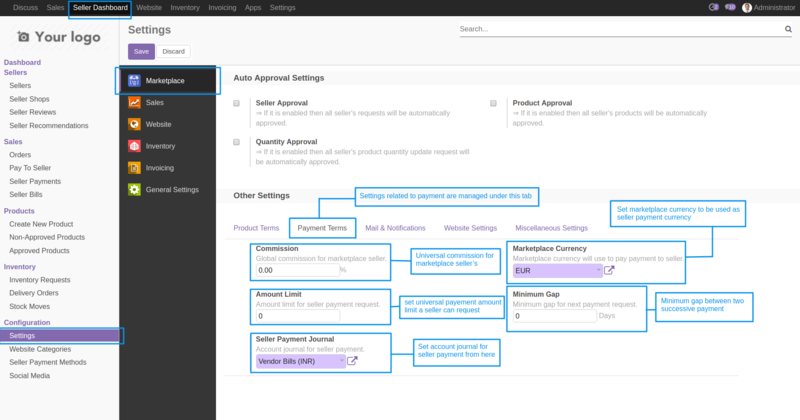 Product pricing: By enabling this admin can allow a seller to use advance pricing. You can set the default payment terms for the sellers. Commission: Using “commission” field admin can set the Marketplace commission. This percentage commission will be globally applied to every seller. Amount limit: Set “amount limit” field, which helps admin to set the amount limit for seller payment request. Let say amount limit declared by admin is 500. A seller can’t request his payment unless his sale amount reaches to 500. It is must to have a minimum sale of 500 to make a payment request. Minimum Gap: Admin can set “minimum gap” i.e the minimum gap between two consecutive seller payment request and that will be in the number of days. Let say admin set the minimum gap of 4 days then the seller can only request for payment after the interval of 4 days to the previous payment. Now, let say admin set the commission 10% for sellers with the amount limit 500 and a minimum gap of 4 days. The seller can request his payment i.e 10% of his commission after the amount limit ≥ 500 and there is a gap of 4 days between current and previous request. If the previous request is pending seller can’t request the new payment request. To make the seller payment request amount limit must be ≥ greater than or equal to set amount i.e 500. Only after minimum gap fulfillment, the next payment request can be made by the seller i.e only after 4 days seller can request for his next payment. Seller payment journal: Set account journal for seller payment. Marketplace currency: Set marketplace currency to be used as seller payment currency. 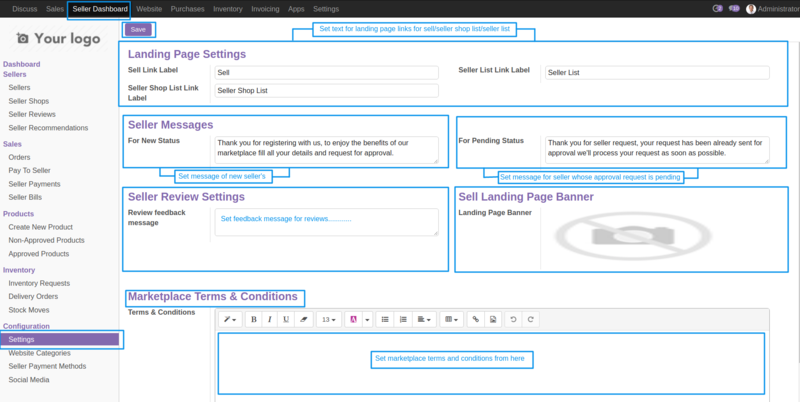 Now, you can set the configurations for e-mail notification to be sent to the seller in your marketplace. These fields are set by admin to send mail notification or keep alert about every activity in his marketplace. The notification email content can be set by the admin. Various fields are enabled/ disabled according to requirement. On new order: a notification email can be sent to seller when any new order is made from seller shop if the field “Enable notification for seller” is enabled. 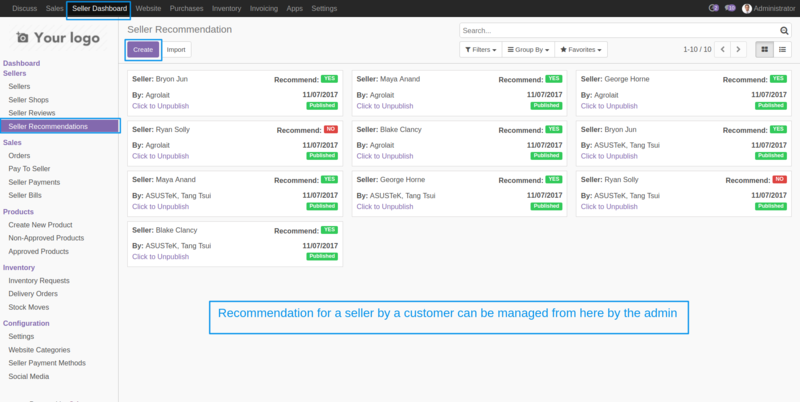 New seller request: a notification email can be sent to admin or to seller when any new seller request is made if the field “Enable notification for admin” and “Enable notification for seller” are enabled. 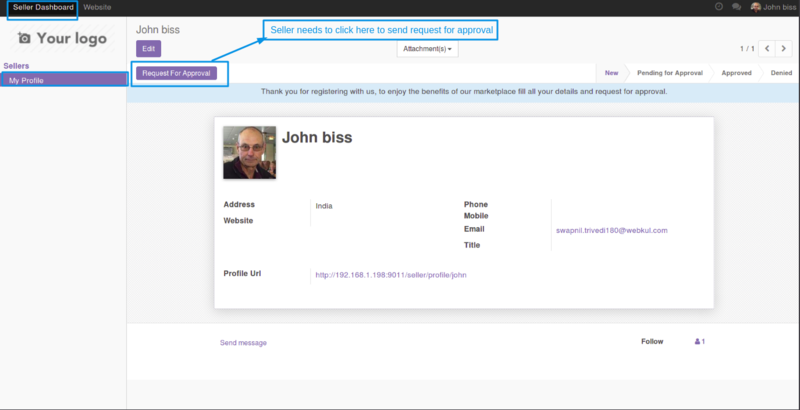 On seller approval/rejection: a notification email can be sent to admin or to seller when any new seller request is approved/rejected if the field “Enable notification for admin” and “Enable notification for seller” are enabled. Product approval/rejection: a notification email can be sent to admin or to seller when any new product added to shop is approved/rejected if the field “Enable notification for admin” and “Enable notification for seller” are enabled. Product count: This field is enabled to show the seller’s product count on the website. Sale count: This field is enabled to show the seller’s sales count on the website. Seller address: This field is enabled to show the seller’s shipping address on the website. Seller since: This field is enabled to show the very first day the seller joined the marketplace. Recently added products: This field is added to show the number of the most recently uploaded seller’s product on the website. The maximum number of the recently added product that can be displayed is 20. Let say the defined number of recently added products is 5 and seller uploaded 12 products then the number of products that will be displayed in the recently uploaded product is the 5 products which will be uploaded in the last by the seller. Return policy: If this field is enabled then seller’s return policy will be displayed on the website. Shipping policy: If this field is enabled then seller’s shipping policy will be displayed on the website. Terms & Conditions: If this field is enabled then seller’s Terms & Conditions will be displayed on the website. Contact to seller Button: If this field is enabled then “Contact seller” button will be displayed on the website which helps the customer to contact directly to the seller. Recently added products: Enter the number to show recently added products by a seller. The number should not exceed 20. Seller review: If this field is enabled then seller’s review will be displayed on the website. Note: Any customer can only give a review to any seller if and only if he purchased this product. 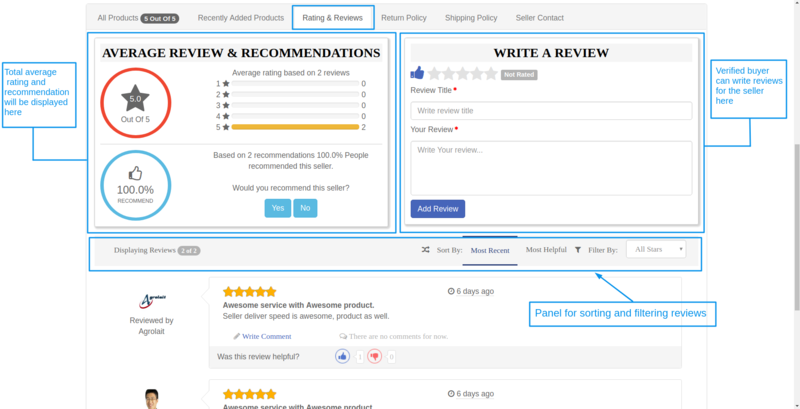 Display seller review: Using this field admin can specify the number of seller’s review which can be displayed at once on the website without clicking on more button. Auto publish review approval: If this field is enabled then seller’ review will be auto-published on the website. 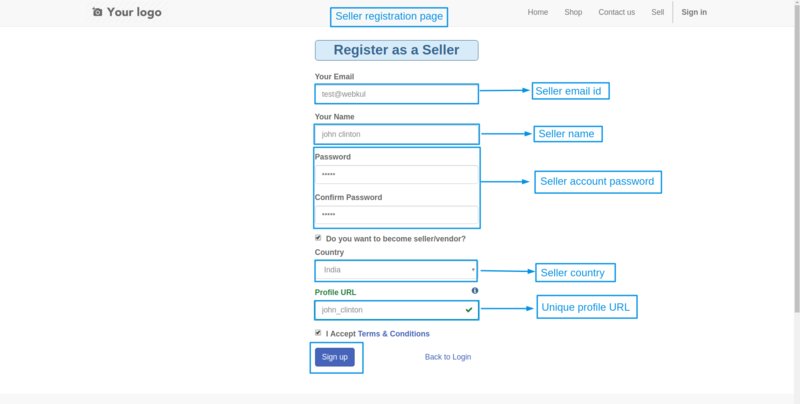 Sellers list: If this field is enabled then sellers list will be displayed on the website. 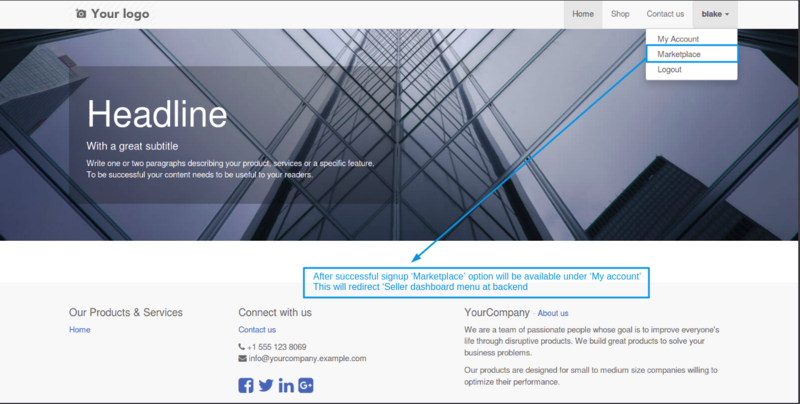 Header sell menu: Enable if you want to display sell menu in header section on the website. Footer sell menu: Enable if you want to display sell menu in footer section on the website. Click to configure miscellaneous setting: Admin needs to click on miscellaneous settings in order to manage some extra settings of his marketplace. 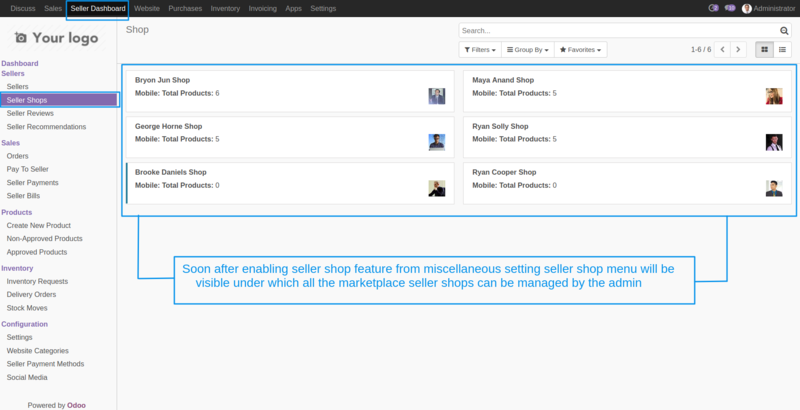 Enable seller shop: By enabling it admin will be able to see seller shop menu available under his seller dashboard menu. Admin can also hide or show seller shop to the buyers. 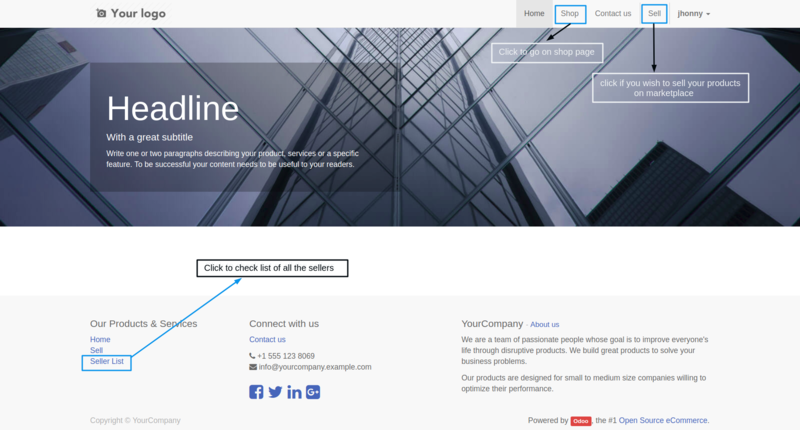 Sell link label: This field helps to customize the “sell” label. Seller list link label: This field helps to customize the sell list label. 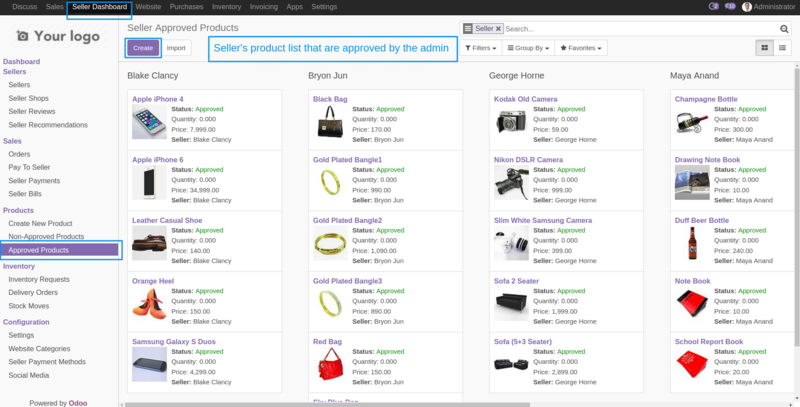 Seller shop list link label: This field helps to customize the seller list label. For new status: Set message for new sellers. This message will be displayed when the request of the seller is in the new stage. For pending stage: Set message for pending sellers. This message will be displayed to a seller when his request is in pending stage. Review feedback message: This field helps to set the default review feedback message. Terms & conditions: This field helps to set the default marketplace Terms & conditions. 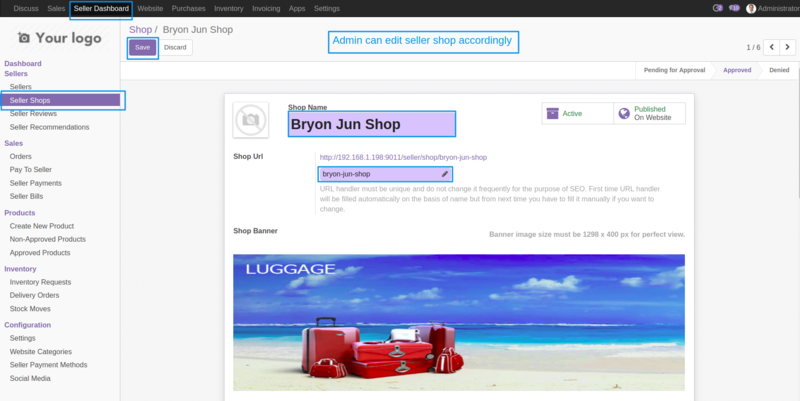 Soon after enabling seller shop feature admin can see and edit shops of the seller’s. Admin can also edit seller shop accordingly. Here is the new and enhanced dashboard from where admin can check for the summary of the marketplace seller, products, order, and payments. 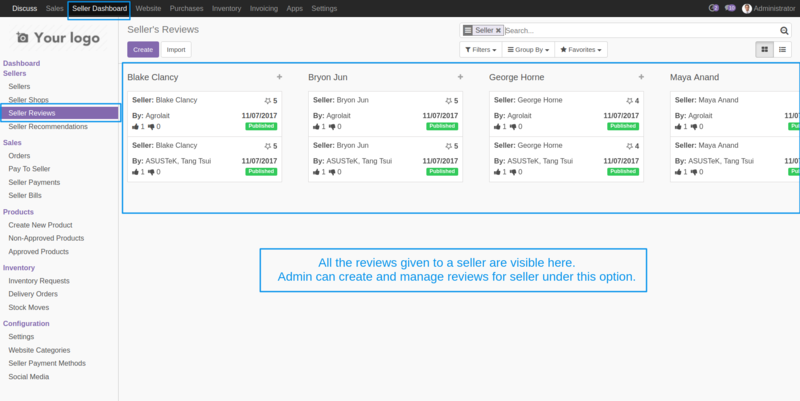 Under Seller dashboard, the admin will get these menu to manage his marketplace efficiently and effectively. Admin can check the list of sellers according to their status defined whether it is approved, new, pending or rejected. All the seller details can be seen or edited here. For every seller, admin can override the default settings of the marketplace. 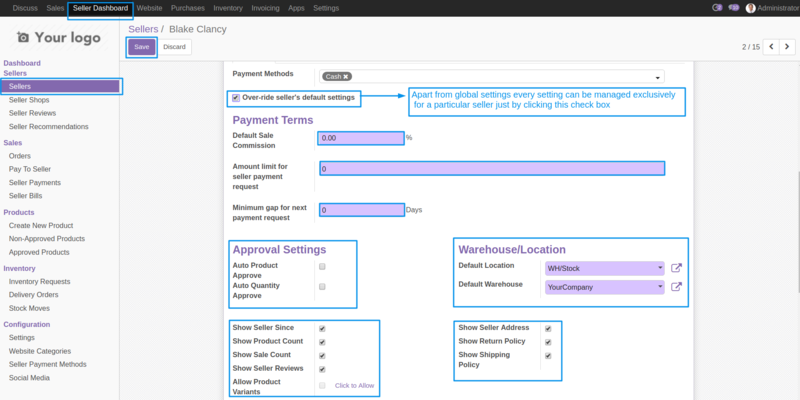 Seller Payment, profile, and shop policy can be seen in the admin panel. Apart from global settings some settings can be managed exclusively for every seller admin just needs to enable the checkbox to override default seller settings. Marketplace currency is defined under the payment tab. Marketplace sellers review can be seen here. 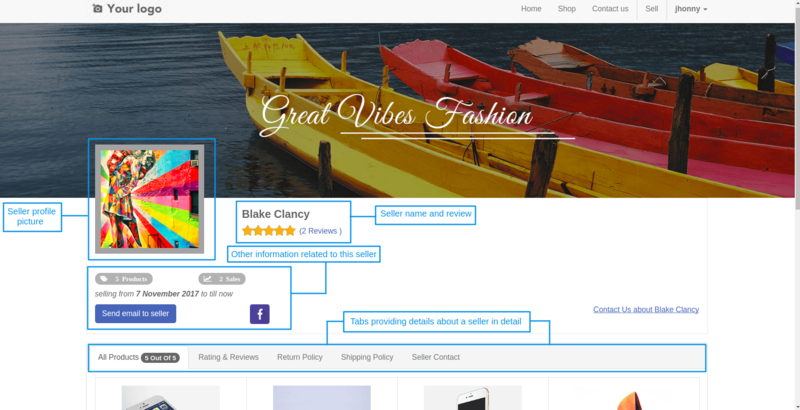 Trust indicators in your store are very important and making reviews clearly available on your site is a great idea to gain the trust of buyer hence we have provided admin the access to create and edit a review. The marketplace sellers recommendation can be seen here. Marketplace orders can be seen here. Under Seller Dashboard of the admin panel, all the sales order for the marketplace related products can be seen here for every individual seller. Pay to seller is a menu introduced for the admin to make payment to his seller. Using pay to seller admin can make payement to his seller with less efort. From seller payment admin can check every basic detail of the seller payment from here. A bill is an evidence that the payment was made to a particular seller. Hence under seller bills, menu admin can check all the bills generated for a seller. There are three menu for selling products, one is to create new products, non-approved products for all those products which are yet to be approved or in pending state and other is for approved products on the marketplace. 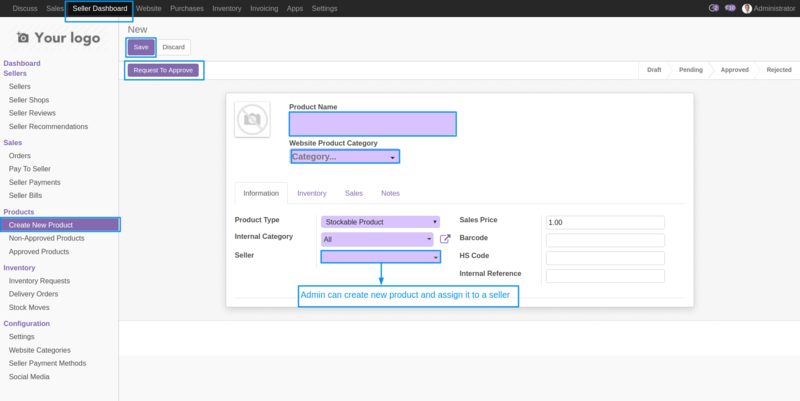 From create, new product admin can create a new product for a seller. A non-approved product is of three types they can be either in the draft, pending or reject list. Here is the list of product list approved by the admin. Inventory request is sent by the seller which is approved by the admin. Admin can also create inventory request for a seller. View of delivery orders for the products sold in the marketplace. Admin can check the stock moves of seller product from this page. The seller can have access to the seller dashboard from the marketplace website front end. A seller can update his profile page, shop page, add products, request for inventory, check for the order for his products, also check for the delivery order of the products. Once approved seller can check and edit his details on my profile menu. On the top right corner, there are payment details for that particular seller. Once approved seller can manage marketplace settings. 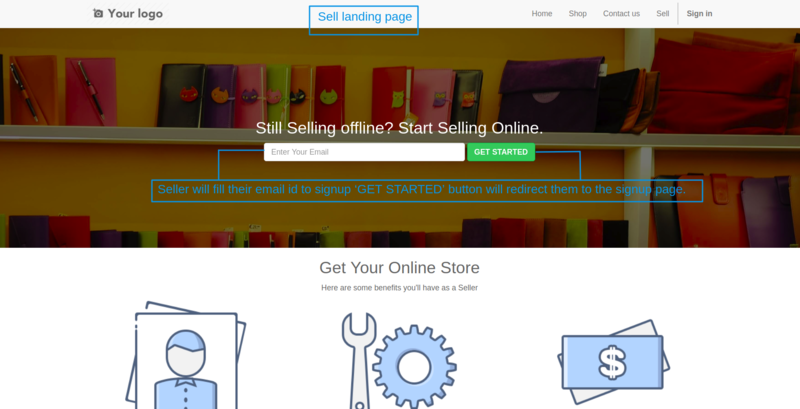 With the help of this module, a seller can create and manage his own shop accordingly. Orders view from the seller account on marketplace end. All the payments related to this seller will be reflected here on this page. A seller can create his products from this page for this he just needs to fill the necessary details and click on request to approve button. A seller can check his list of non-approved products from here. A Seller can view all his approved product list on this page. From the Inventory request menu, a seller can request admin whenever he needs to update his inventory. Check delivery order and its status. Record of every stock move of sellers product is defined here. Sellers will click on the sell link to sell their product in the marketplace. Under Seller list link viewer can check the list of sellers in the marketplace. Sellers will be displayed like this inside the seller list link. Seller shop will be displayed on seller’s profile. On click of the sell button on the marketplace website, sellers will be redirected to this seller landing page for registration or login. After a seller will successfully register he can find his way to the marketplace under my account option. 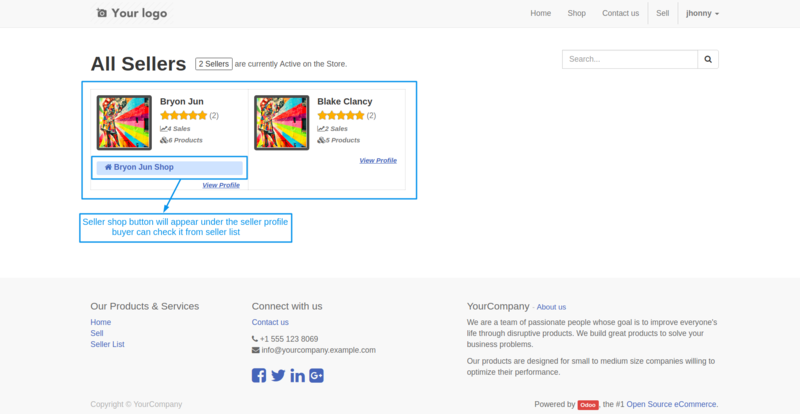 Product view on marketplace website. 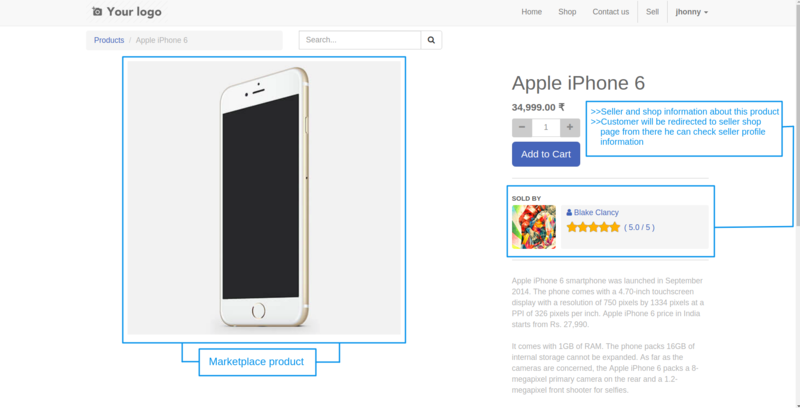 On the product page, customers will find the seller information, on the click of the seller profile page customer will be redirected to the seller’s profile and on the click of the visit shop option customer will be redirected to the seller’s shop page where he can find all the products sold by the particular seller. Buyers can check review and recommendations for a seller. A verified buyer can also write a review and help other buyers to improve their shopping experience.